UTV Ireland’s Joe Mahon has spoken candidly about his family experience of Multiple Sclerosis (MS) at the launch of a fundraising campaign to create a respite centre in Inishowen. 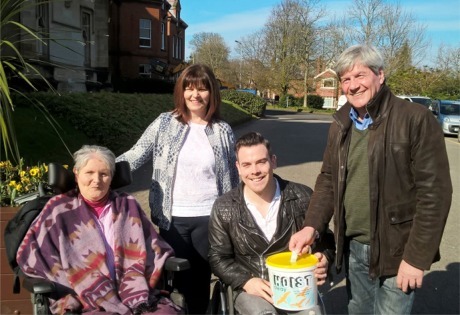 Derry group Hoist Away is planning holiday accommodation with a difference in Inishowen and the Lesser Spotted Journeys’ presenter kick-started their Pound Appeal. People are asked to donate just £1 to the appeal. “Hoist Away’s Culdaff Cabin will cater for people who are confined to wheelchairs and require hoisting. I am convinced that it will be greatly welcomed by the many families who are responsible for the care of family members who need this level of assistance to get through life," said the television presenter. “My own father, Jim Mahon, suffered from MS for many years. He required constant care and help to get through each day, as he could do nothing for himself. Life would have been impossible for my mother, who was his main carer, had it not been for the range of lifts, hoists and other equipment necessary to move him from one spot in the house to another. UTV presenter Joe Mahon who has spoken about his family experience of MS as part of a new campaign to build respite holiday cabin in Culdaff. “They were both afforded some respite from the daily grind whenever he was taken into a residential nursing home or into hospital, where he always received the utmost care from dedicated people. “However, to have had a facility such as the log cabin in a beautiful location like Culdaff, where they would have been able to enjoy a holiday together and where all of the necessary equipment was available, would have been of enormous benefit to their situation and I am sure, would have been a great boost to their morale and that of the whole family,” he added. Hoist Away’s Catherine Farrimond explained that donations to the Pound Appeal can be made at www.facebook.com/hoistaway and through PayPal.